The Tableau Public team believes that every visualization should either start or continue a rich and constructive dialog around data. It's an amazing time to be alive: countless new data sets are published every day, talented and bold individuals and organizations around the world are turning that data into engaging visualizations, and as a result, our societies are changing for the better. Just ask Sarah Ryley of New York Daily News. Her timely report on racial disparities in the NYPD's "broken windows" crime fighting strategy following the death of Eric Garner last summer was cited in a Congressional delegation's call for a federal investigation. Talk about a dialogue! Our team - Jewel, Tara, Andrew, Sophie, Dash and Ben - find and publish one "Viz of the Day" each weekday to shine a spotlight on the work of this community of authors. Some vizzes are incredibly complex and others are remarkably simple. Some have been intricately designed and others use the defaults. Some deal with grave topics while others are fun and even downright silly. Some we stumble on ourselves, while still others are nominated to win. They all have one thing in common though: they're engaging and they promote a compelling dialogue that our team wants to be a part of. But let us be clear: none of the vizzes we select are perfect. That's because there is no such thing as "perfect" in data viz. Visualizations can always improve. There are aspects you would do differently. There are aspects we would do differently. That's okay. And don't be mistaken: just because a particular viz wins Viz of the Day doesn't mean it has Tableau's rubber stamp of approval as "the right way" to do it. The truth is, we don't even have a stamp like that. Nobody does. Since Viz of the Day reflects the work of a community that includes authors from a wide variety of backgrounds, disciplines and skill levels, you should expect more variety - both in terms of topics and techniques - than you would get from a group of data viz gurus alone. Remember: it's all about the dialogue, and sometimes a new and intriguing dialogue gets started by someone with their own unique perspective on data. We encourage you to enjoy the variety, get inspired by something new each day, and participate in the dialogue. Since every viz is an amalgamation of great and not-so-great, we have an opportunity to share our opinions and expertise. That's why the dialogue can be so rich. It only stays rich if it remains constructive. One way to keep it constructive is to talk about what works - "plusses" - and what could work even better - "deltas". And don't stop with telling us - show us another angle by downloading the workbook, remaking it, and publishing your own version. Tableau Public is built for that. The dialogue: on your blog, on social, and now on Reddit! If you don't have your own blog or website to voice your opinion, that's okay - you can always share your thoughts on social media. 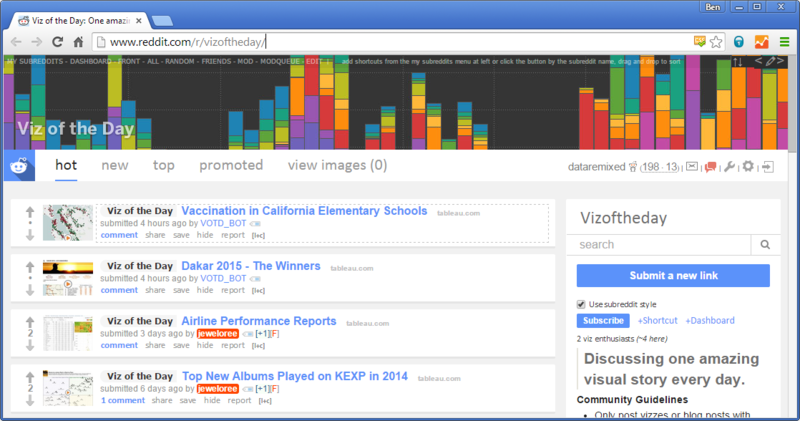 We've set up shop on Twitter, Facebook, and our own uber-redditor Jewel Loree recently created a Viz of the Day subreddit! So...where do I go for Tableau's "best practices" then? If you're hoping to learn about what we at Tableau consider "best practices" for data visualization, read one of our white papers (especially this one, this one and this one), check out the visual gallery on our corporate site or the "Greatest Hits" gallery here on the Public site. Those are galleries that contain what we consider to be the best of the best. But even they aren't perfect. And that's part of what draws us to this space - the opportunities to enhance, fine-tune, and improve are endless. Thanks for reading. We'd love to hear your thoughts about the vizzes we select, what works well, what could work better, and don't forget the topic itself - what does a viz say about the world we live in, and how does that impact you? We feel fortunate to be part of a growing and supportive community that love data visualization as much as we do.